UPDATE (7/25/09, 10AM): Theodore Roosevelt Lilly, also known as Ted, will be placed on the D.L. today with shoulder tendonitis. He is expected to be out for about two weeks. What is being discussed internally is whether Tedders should undergo arthoscopic surgery on his knee to get it cleaned out. If he opts to have the surgery, he'll probably be out an additional week. If he was a position player, I would say no, but we're likely talking about one start, so I say, get it done. Initially, the Cubs are recalling Justin Berg from Iowa. Berg was added to the 40 man roster this offseason. He is 4-1 with a 2.00 ERA in 24 appearances at Iowa. Righties are hitting .167 off him. He was acquired in exchange for Matt Lawton from the Yankees. I wonder if he's being showcased for a trade. Berg has been great this year, but injuries have inhibited most of his career. The Cubs have other options to call on, so this was a bit of an odd choice. The Cubs reportedly have interest in the Pirates John Grabow to fill their need for a second left-handed reliever. Grabow is 3-0 with a 3.65 ERA in 44 innings of work this year. His 2.3M dollar salary makes him an attractive option for the Pirates to move. 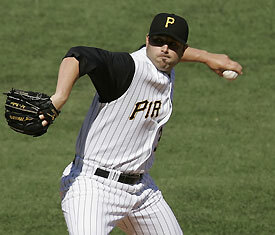 But the potential loss of Ted Lilly (who will miss his next start and reports are that he's likely headed to the D.L.) may increase the Cubs interest in dealing with the Pirates, because they've also talked to the 'Rates about Tom Gorzelanny. Gorzelanny made a brief stint with Pittsburgh as a reliever this year without much success, but he has a 2.46 ERA in 14 starts at AAA Indianapolis. He has 2 complete games and has struck out nearly 1 batter per inning (79 in 80 and 1/3 innings). There's even an outside chance that the Cubs will add Freddy Sanchez. Sanchez is a former batting champ who's hitting over .300 this year, but doesn't bring much else to the table. He doesn't draw walks (his OBP is .340) or steal bases (5 this year, but 10 total in his career). He's another right-handed bat in the lineup, but the amount of PT he logs would be the question. The Pirates offered him a 2 year contract, but he seems to want out of Pittsburgh, so the Pirates knowledge of this and his 6.25M dollar contract make his expendable.